These guidelines will help you to have a successful, rewarding experience learning an instrument. Adults can start any instrument at any time. Their success is based on how willing an adult is to commit to practicing. We teach beginning adult students of all ages. For children, starting at the right age is a key element to the success of their lessons. Some people will tell you “the sooner the better” but this attitude can actually backfire and be a negative. If a child is put into lessons too soon they may feel overwhelmed and frustrated and want to stop lessons. The last thing you want to do is turn a child off music just because they had one unpleasant experience which could have been prevented. Sometimes if the child waits a year to start lessons their progress can be much faster. Children who are older than the suggested earliest starting age usually do very well. The following are guidelines we have found to be successful in determining how young a child can start taking music lessons. 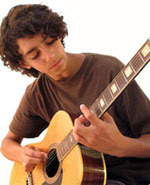 8 years old is the earliest we recommend for guitar lessons. Guitar playing requires a fair amount of pressure on the fingertips from pressing on the strings. Children under 8 generally have small hands and may find playing uncomfortable. Bass guitar students generally are 10 years old and older. 8 years old is the youngest age for private vocal lessons. 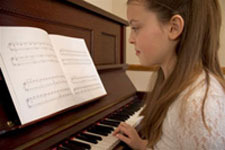 Due to the physical nature of voice lessons (proper breathing techniques, development of the vocal chords and lung capacity), the younger body is generally not yet ready for the rigors of vocal technique. We accept Violin students from the age of 6. Some teachers will start children as young as 3, but experience has shown us the most productive learning occurs when the beginner is 6 or older. Due to lung capacity (and in the case of the saxophone the size of the instrument), we recommend that most woodwind beginners are 9 years old and older. Brass instruments require physical exertion and lung power, 9 years and older is a good time to start. 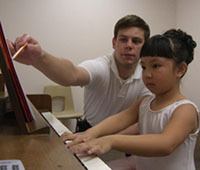 Group classes work well for preschool music programs and theory lessons. Private lessons are superior since in private lessons it is hard to miss anything, and each student can learn at their own pace. This means the teacher does not have to teach a class at a middle of the road level, but has the time and focus to work on the individual student’s strengths and weaknesses. For that lesson period, the student is the primary focus of the teacher. Most Importantly . . .